Can’t Hardly Wait – Drink or Cellar White Wines? A common wine fudge and misconception is the older the wine, the better the wine. We’ve all been brought up hearing references by suave characters in film, TV, and literature, sipping on some aged wine or booze of some sort. What refinement, excess, expense, and therefore class! But the truth is that while there are absolutely some wines that merit or even need to be hid away in your cellar for so many years, it’s much more common that the wines you can find on any store shelf are ready to drink. In general, wines meant for forgetting in a cellar are: complex, concentrated, full of firm tannins (=a compound from the skins of grapes, stems, and oak), high alcohol, and high acidity. We’re talkin’ big boned and bold guys that have at least most if not all of these elements…these are no lightweights! In short they need the physical structure and the complexity to have potential to evolve in a pleasant way in the bottle. The vast majority of wines that want to hibernate and develop before drinking are red, and more often than not these types of big wines spend a good amount of time being aged before release on the market – sometimes 4 or 5 years even! In these cases, by cellaring the wine you are allowing it to mature and improve. Wines that are drunk too young might be unpleasantly astringent, dull, harsh instead of elegant or juicy, and flat instead of complex. White wines are much less likely to be ageworthy for several reasons. One reason being that most white wines lack tannins, a structural element that really helps reds age. Another reason is because most whites (Italian and otherwise) are made to be fruity, light, refreshing and enjoyed young. Time will make that fruitful youth fade, leaving a sort of stale and tired acidic wine past its prime. Accidental oxidation can happen too, you’ll recognize it by a bright white wine turning from a lively gold or lemon color to a brownish dull oxidized mess. This is not fixable…wines ruined by oxygen exposure have to be simply poured down the drain, the saddest of wine fates. Even with proper storage, oxygen can get into the bottle one way or another and spoil everything, especially on bottles not meant to keep for long periods of time. It’s important to note that wine going bad from either too much time or oxygen exposure is not the same as being “corked”. Cork taint (that unmistakable odor of wet paper, cardboard, musk, or cork itself in the wine) can happen to any bottle sealed with a completely or partially non-synthetic cork or screw cap. The exceptions then are white wines with a lot of structure, flavor and texture complexity, fuller body, high acidity (which acts as a sort of conservative), higher alcohol or sugar content and/or contact with “noble rot” (=Botrytis, a desired type of mold used to make some dessert wines). Some of the longest-lived wines are white in fact, like Burgundy’s Chardonnay-based wines like Chablis, big and burly California and Australian Chardonnays, Germany’s Rieslings, Hungary’s Tokaji and other sweet dessert wines like Bordeaux’s Sauternes and more rarely some exceptional years of Champagne-though time kills the bubbles making sparkling wines go flat. All this to say, very few Italian wines are on this list of ageworthy white wines. So if you’ve got an Italian white, it’s probably ready to drink within the few years around the vintage. 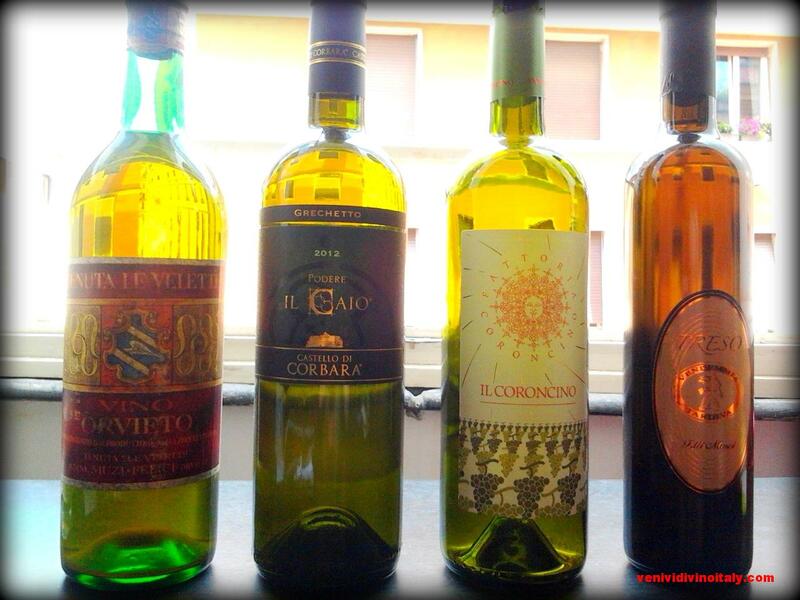 From left to Right- Orvieto 1963, Grechetto from Umbria 2012 (Castello di Corbara), Verdicchio dei Castelli di Jesi Classico Superiore 2010 (Il Coroncino), and a Lazio Moscato dessert wine “Vendemmia Tardiva” (Agricola Fratelli Masci). Orvieto 1963– This guy is beyond past his prime…this wine probably needed to be drank well before astronauts landed on the moon! It’s now a decoration rather than something to keep on the rack. If I opened this bottle and drank it, it wouldn’t kill me (wines don’t generally become toxic when they go “bad”), but I doubt it’d be enjoyable. If you find an old dusty mystery wine bottle in your wine stash, some research on the wine type and varieties might shed light on if it’s drinkable or become a paperweight, though really you can’t say for certain unless you give it the old fashion taste-test! The Grechetto from 2012– This is Umbria’s beloved white grape variety and being such we already know this is a light’n’easy wine, meant to be fruity and refreshing. This is one of many (and most) Italian whites to drink now and NOT put away for ageing! The Verdicchio dei Castelli di Jesi Classico Superiore 2010– Firstly, this is an exceptionally good wine…get your hands on it! Secondly, with already some years of ageing before release and the fact that alongside it on the shelf you might find a lingering 2009 version of the same wine, we can already start to understand that this is a wine that has some capability to age. It’s got some key characteristics that let it evolve, like high acidity, textural complexity since it was fermented in oak as well as aged on its lees (=dead yeast after fermentation) for months before bottling. This might not be able to age extensively, but I think the 2010 vintage/bottle will be OK for another few years at least. The Moscato ”Vendemmia Tardiva”– a dessert wine made from late-harvest grapes in the Lazio countryside, is the wine in this particular line-up with the most ageing potential. It’s got high acidity (all dessert wines do) and super concentrated flavors from raisined late-harvest grapes. Similar and also ageable Italian whites might be labeled “Muffa Nobile”, wines made from grapes effected by Noble Rot. 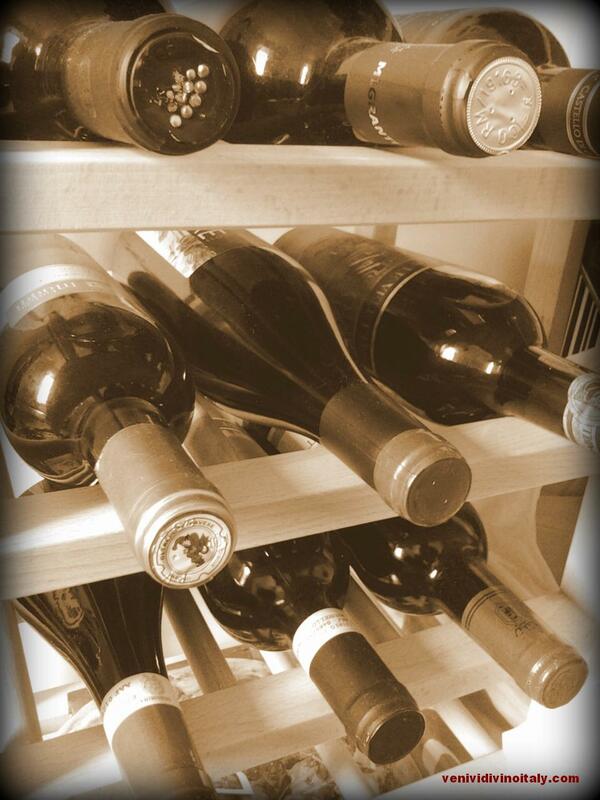 One final word of advice on wines, ageing, and knowing if it needs to be opened or left alone: buy a few bottles of a wine at a time so that if you open it and it wasn’t ready, you’ll have a back-up bottle! This entry was posted in Italian Wine FAQ and tagged Ageing wine, cellaring, cork taint, FAQ, Italian Wine, keep or drink?, old wine, oxidization, Wine, young wine. Bookmark the permalink. 2 Responses to Can’t Hardly Wait – Drink or Cellar White Wines?